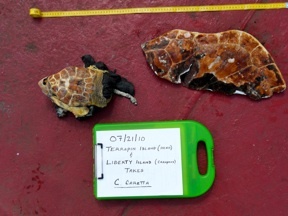 One of the world's biggest environmental crimes has been more or less forgotten. This is part of our collective guilt as the world's ecosystem continues its accelerated collapse. But the new documentary film The Big Fix takes a detailed, daring look at what happened in the Gulf of Mexico with BP's Macondo offshore oil drilling rig. The story and facts that emerge are more than disturbing. The movie is soon getting its major national release in theaters and on Netflix. Viewers will be made to recall the unsettling images of oil slicks, fouled fowl, suddenly unemployed fisher folk, and empty assurances by BP and the Feds. The partially U.S.-owned British oil company has its origins in geopolitical skullduggery in Iran, explained in the film's narration and images. The history makes more convincing the subsequent telling of the corporation's and the U.S. government's going to great pains to lie that all was being done that could be done to minimize the blowout's damage and to clean up the mess. But there was even more going on, undisclosed to the public, such as the extent and effects of massive application of toxic Corexit. This amounted to a double assault on the Gulf, done deliberately. Those who believe that the whole episode from start to finish was an accident, and that industry and government did their best with a bad situation, are sadly ignorant. Or, they wish to simply keep driving and consuming petroleum in other ways, because deep change is inconvenient or frightening. 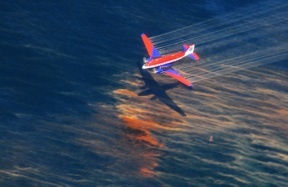 Corexit, a dispersant banned in the UK, was immediately employed by BP soon after the blowout, and was ordered stopped by the U.S. Environmental Protection Agency. But BP kept on openly using it, and then secretly so, as The Big Fix tells us. Even more outrageous was that when the undersea oil well was capped, and scrutiny by the average news-consumer slacked off, people were soon misled by corrupt spokespersons that the oil was benignly disappearing. There were contradictory reports of remaining oil pollution that flew in the face of U.S. and industry claims that the oil was 75% gone. It certainly was not gone, and the bulk of it remains today -- perhaps in part from additional ocean floor oil leaks. 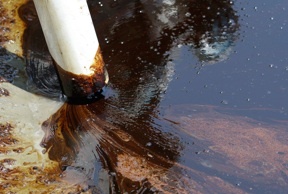 The oil has slowly been moving into the Atlantic, and may damage the Eastern U.S. seaboard. Some environmental activists during the crisis' height did more than hand-wringing and crying out for a clean energy economy some day. We instead called for an immediate step-down in U.S. oil consumption to compensate for what the BP blowout was spewing. Our coalition, World Oil Reduction for the Gulf, was gathering steam when the blowout was capped, but everything naturally went back to business as usual. But some activists, such as Josh and Rebecca Tickell, were just getting heated up. They could not keep their muckraking lens away from the Gulf, and be like almost everyone else who just moved on in their minds and ignored the plight of the Gulf. The BP blowout and subsequent reports of persistent damage to wildlife and human health were enough to draw the filmmakers to the New Orleans region, Josh Tickell's boyhood home, to check out the whole situation in 2011. Along for the ride with the Tickells on their rolling headquarters-bus was Peter Fonda, friend to the sea and bait for star-struck Cajuns. The Big Fix's first dramatic device was to show footage of Fonda in Easy Rider, synced with Steppenwolf's Born to Be Wild hard-rock tune. It is surprising how big the oil spill was allowed to get, creating in weeks the biggest environmental disaster in U.S. history. Although it did appear to be out of control, there was, in effect, permission for the whole debacle from "our" soft-on-Big-Oil federal government. As we are also forced to suspect that the oil is mostly still there, spreading inland still from the sad coast, hatred breeds in the sensitive viewer of The Big Fix for both BP and the U.S. government. Corruption of academic oil experts and state environmental officials is rampant, according to The Big Fix, and many of their statements about the disaster are shown to mainly deception. In contrast, featured in the film as a critic of the clean-up at the well-head source was Matt Simmons, petroleum industry investment banker. He was extremely vocal but soon died somewhat mysteriously, as the film narrates. A number of solid, well-known journalists and academics round out the sleuthing done by the filmmakers, exposing the specific corruption in dollar amounts that swayed the public about the disaster. Louisiana is shown for its oily politics as a colonial region for exploitation. For this film Josh and his wife Rebecca Tickell found living, homegrown heroes and villains, as well as many a victim of oil and Corexit. Sadly, Rebecca turned out to be one as a result of her curiosity and diligence for The Big Fix. In the film it does not say how she made out, but this reviewer is glad to report she appears today to be in very good health. One anti-oil activist voiced criticism of the film after a pre-release screening in April. He supports the film's excellent aspects, but he was disappointed that "the film wound up with the message of 'Go out and protest!' -- then to see little else was suggested for action when at the end of the movie the two filmmakers are just riding their bus and burning fuel off into the sunset." This was incongruent, the activist said, "because oil is horrible and the filmmakers were being wasteful instead of catching trains." I heard the bus is outfitted for using ethanol, but maybe the availability of E85 fuel was poor for the trip. The ethanol aspect was not shown in the movie. Culture Change: The Big Fix nails BP and the collusion the U.S. gov't has with corporate megapollution. But isn't the solution to do more than punish BP or prevent more disasters? Oil consumption would continue -- a slower way of destroying the environment. We can support renewable energy, but this mainly provides electricity which is only one of the features of petroleum. Josh Tickell: Yes. The solution is simple: stop using oil. Everything else will be a band-aid. But I am a personal zealot for innovation. Moore's law [that the number of components that can be placed on a computer chip doubles every 18 months] is now active with solar panel efficiency and price reduction as well as peak oil. We live in a time of inherent transition and change. We forget that we are where we are (both in good and bad ways) because of exponents. The key with energy is to focus on where we (as a species) wish to be and take a little step in that direction. Six or seven little steps may see a one hundred fold increase in solutions. Culture Change: So, what do you and Rebecca think of a life-style-change approach to oil addiction and corruption, to kick Big Oil where it hurts? Do you endorse bicycling, walking, sailing, living car-free, and boycotting petroleum? Josh Tickell: Yes to all of the above. It is inevitable that our future will hold both opportunities for us to travel more sanely (in bikes vs. hummers because of safe community re-design) and at the same time much faster (through high speed rail etc.). Again, the first move is ours. Social exponential growth means we don't have to take too many steps before we - billions of us - suddenly arrive. Culture Change: what's the latest on developments such as Netflix, awards for TBF, and the Lionsgate release date? Josh Tickell: All formats will release on June 19th including digital, dvd, pay per view (cable tv) and a few select theaters. The Big Fix could be an unprecedented tool for anti-oil activists to rally around for systemic change. It won't do much good to boycott one oil company. But the images of the film with its insight can serve to get the average American to question oil dependence as never before. We'll know this is happening when shoppers, for example, are offered plastic packaging or products, and they say, "No thanks, don't you think that's like BP crap?" At this point of global oil extraction's peaking, approximately now, there is no comparable, scalable substitute for petroleum and its high energy content or flexibility of application. The cheap oil is gone, but the modern industrial infrastructure is completely oriented toward oil. Moreover, modern society obtains its food almost entirely via cheap (now much subsidized) petroleum, while this only adds to greenhouse gas emissions. 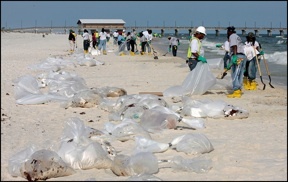 The BP disaster in the Gulf on its own may soon seem like a minor event compared to what's in "the pipeline." The message of changing culture -- instead of chasing the Holy Gail of techno-perfection for continued mastery over nature -- is what Culture Change has promoted for over two decades. It is all well and good to react with outrage and sadness over BP's and the U.S. government's irresponsibility and warped value system. Protest in the streets, Occupy, and Facebook activism are cool. But lifestyle change is key, for it deals with the tricky question of how hard the regulators are trying to secure smoother and quieter oil extraction. We believe we're making progress on fundamental change overall. It is hard to tell. We do know that when one spends too much time pointing the figure at this bad actor, then that villain, and lamenting this or that failed policy, it is time to look deeper. The dominant critique, that has a hard enough time as it is trying to break through the corporate media, needs to address the system we live under, the culture, and Western Civilization itself. The Big Fix blames not just the Gulf disaster but the whole problem of Big Oil's influence and government corruption on the top few in society. The Big Fix also implies that putting up solar panels is the best answer to oil spills. But solar panels can't actually go very far in replacing oil. The film's writer, Johnny O'Hara, may not have intended to simplify so much. But an interview with a favorite shrimper in the film who sings the praises of solar panels contributed much to the film's message. The film mentions that the U.S. and the world are running out of oil, and that collapse is the endgame (David Korten's on-camera statement). But what we do about it for long-term sustainability is not the film's strong point. These weaknesses may be minor, for The Big Fix is beautifully produced and will open many eyes. Putting our Earth first will be our salvation. If we can soon shut down fossil fuel extraction and burning the world over, and plant trees as one people united to save our climate from the greenhouse hell we have unleashed, we might continue to thrive on a post-petroleum, post-industrial planet. We have to share it with all fellow species. If we get there, and can overcome overpopulation safely and in a just fashion, we will then also find ourselves liberated from modern slavery (for often meaningless jobs) and again relate to each other as equals in our new-found universal culture of community. Watch The Big Fix official trailer. Officially, the April 20, 2010, BP's Deepwater Horizon oilrig explosion began the release of at least 4.9 million barrels of oil. 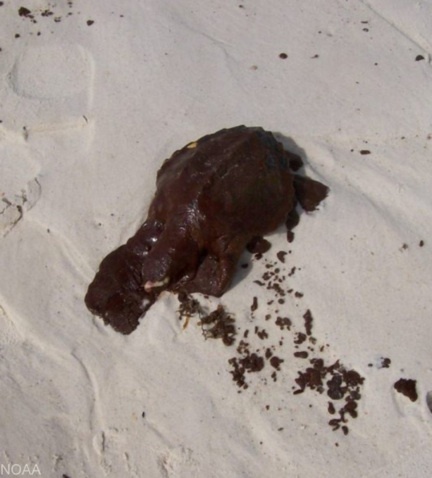 BP then used at least 1.9 million gallons of toxic Corexit dispersants to sink the oil [The Big Fix suggests instead perhaps 40 mm gal.]. Details in a round-up of articles published by Al Jazeera two years later. Scientists call on Obama to stop chem-spray Over 100 scientists and academic institution, research laboratory, conservation organization leaders plus human rights defenders signed statement calling for the Obama Administration to immediately halt chemical aerial spraying in the Gulf region. 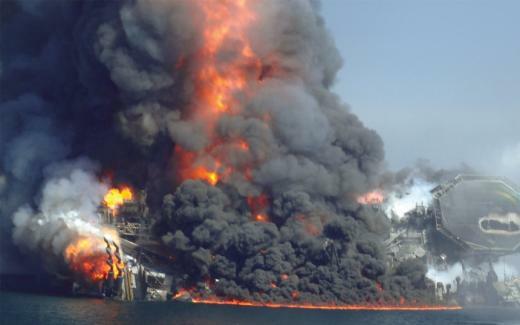 Ex-Spill Worker Details 'Interrogation' Upon Dismissal A former contractor working in the BP oil spill cleanup was interrogated and fired for what he knew: "I took pictures of something and I brought it to the attention of the command structure and whatever I took pictures of, 12 hours later I was gone." Photo courtesy BP. Thanks for nothing, sleezoids! Like you, I'm looking forward to seeing this film but I suspect that it won't change a thing. Forgive my pessimism and cynicism. There have been other films - Inconvenient Truth for example - which have laid out clearly humanity's destruction of the planet. I'm started my own Blog to try to raise awareness amongst the Baby Boomer cohort (some 85 m in North America) but the response thus far is tepid. What will it take? This Documentary is not only incredibly informative, but also beautifully edited. I found that is was very clear, easy to understand and follow, as well as interesting. These filmmakers are incredibly talented, and their passion is refreshing. I'm not even american, but even I'm angry at the allowances made for these foolish oil corporations. I agree with Frances about the "lotus eaters" there will always be an abundant amount of people who would rather not acknowledge the corruption and general lack of interest in the health of the people, and go about their lives in rosy bliss. It takes strong thinkers and shakers to work collectively to disrupt the control of the governments, and corporations. Wake up and see the world as it is, we will not survive if we don't slow down and look at what has been done to the environment. Where do you stand. I bid good luck and well wishes to all who were ill effected by this preventable event. Keep on fighting, don't give up. Sadly, it is quite possible that our fossil fuel dependent world is in its death throes. Do we actually have the resources to convert to sustainable sources of energy or will there be massive amounts of suffering and death as the current system fails? Those who make the effort to live lightly on the earth believe everyone will join them but will they? Certainly those with power (corporations, police, governments) will do nothing; they cannot conceive of limits to growth. They will not compel anyone to conserve energy. And even the most intelligent, progressive media refuse to contemplate collapse. If your family were facing bankruptcy wouldn't finances be discussed at every dinner? Our news shows mention energy and climate only occasionally.